28 Feb 2015 London Sold Out ! In the words of the poet Tennyson*, we’re going to boogie oogie oogie till we just can’t boogie no more. 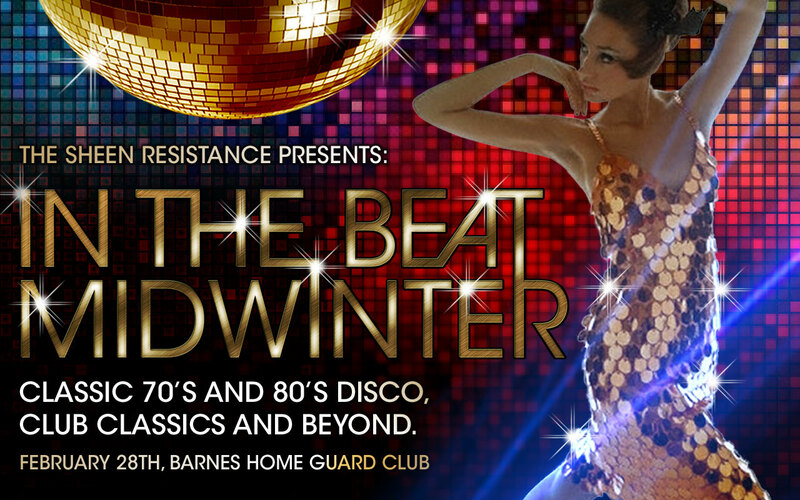 We’re picking up our boots and going back to our roots – the truly unique Barnes Home Guard Club on Saturday 28th February 2015 for what will be the sixth year of The Sheen Resistance – more 70s and 80s dancefloor classics creating that unique blend of Studio 54 and the Ilford Palais. It’s the one after that long, cold, miserable January when we’re all desperate to get together and start having fun again – so come and join us and let your hair down and throw your hands up with a great friendly crowd to a soundtrack that’ll make you feel like you’re in your early 20s again. So – Barnes Home Guard Club, 76A Richmond Park Road, London SW14 8LA from 8.30 pm. *Or was that A Taste of Honey? Whatever. If you missed out, check the Facebook page for updates, or drop us a line.